Reilly1 first came into the clinic in 2005 when she was nine years old. She was in a go-cart accident and hit hard from behind. She was being treated for headaches, whiplash and left torticollis – this is a condition sometimes referred to as “twisted neck” where the head is tilted to one side and the chin is tilted to the other side.) when her scoliosis was discovered. 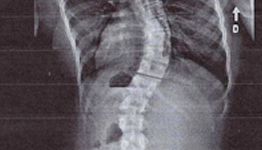 She was diagnosed with severe right thoracic left lumbar scoliosis – the classic “S” curve. Her upper back curve (thoracic) had a Cobb angle2 of 35°. Her initial complaints included minor pain on both sides of her neck, the left side of her upper back and occasional low back pain. Reilly was born legally blind in her left eye. As a very young child her right eye was patched, which helped correct her vision. She now wears glasses and has minimal peripheral vision in her right eye. She also believes that she had torticollis shortly after birth. A posture assessment revealed rotation and tilt in the pelvis and head. Different size eye sockets. Her left eye socket was a great deal smaller than her right eye socket as a result of altered tensions in the cranial bones. Imagine a tight string (tissue) attached at your head and pelvis. This tissue is called Dura Mater – (the hard connective tissue you can feel on the crown of a baby’s head). The dura mater connects the cranium (head) to the sacrum (pelvis) and tension in this structure will affect the direction and degree of boney spinal column growth and can lead to scoliosis of the spine as a child grows. Using osteopathic techniques, such as cranio-sacral therapy to treat dural tension is thought to minimize the progression of scoliosis and perhaps even reduce the curve. As movement specialists, your therapists at Physioactive, will remove joint, muscle, nerve or/and fascial restrictions that are impeding growth or influencing a curvature and rotation of the spine. Cranial therapy is a pain free, hands-on therapy that gently and painlessly improves the motion of the cranial bones. The upper few vertebrae of the spine are also very important in maintenance of a straight spine and allowing the dura and skull (cranium) to move freely. Other hands-on treatments are used to influence the movement of your spinal joints and then teach the muscles and fascia to move and elongate in response to this pain free hands-on treatment. Home exercises were given to Reilly to maximize the benefits of her therapy. Reilly and her family decided to try the SpinCor soft brace to stop the progression of the scoliosis curves. The soft brace is designed to allow for movement, flexibility and strengthening. It also allowed Reilly to be treated at Physioactive while she was wearing her brace. Reilly wore the brace for five years. The developers of the SpinCore brace defined success as no progression of the scoliosis curves while wearing the brace – the brace was meant to stabilize the spine. Scoliosis can create large imbalances in the function of the entire musculoskeletal and fascia systems. This impacts breathing, circulation, digestion and organ function as well as ones overall well-being. With the addition of a personalized exercise program of yoga postures and breathing techniques designed by our scoliosis yoga therapist, Reilly was able to reduce the pain that she had from the muscular imbalances created her scoliosis. She is now off to university and has the confidence to self-manage her scoliosis. Through a personally designed breathing, stretching, and strengthening program we were able to maximize function, reduce scoliosis progression, and minimize the impacts of scoliosis. The customized home program also meant that Reilly was empowered to take control of her well- being and reduced the number of visits to the clinic. 1 The patient’s name has been changed for privacy reasons. 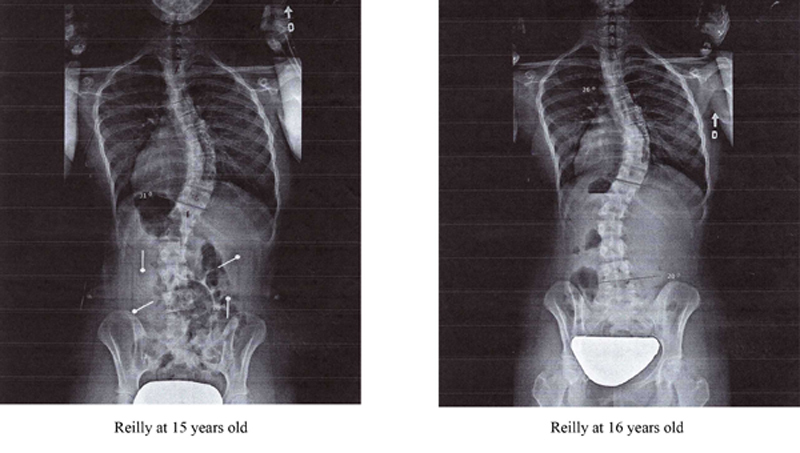 Improvement in her curve in just one year – from age 15 on the left to age 16 on the right (her original x-rays from Sunnybrook were not available).